In this, the second of three posts by T. W. Körner, author of Calculus for the Ambitious (2014) explores Joseph Fourier's ground-breaking work. When asked about his role in the French Revolution, Emmanuel Joseph Sieyès replied ‘I survived it’. Joseph Fourier’s story would now be forgotten if he had not written one of the most inﬂuential mathematical works of all time. In 1807, Fourier submitted a memoir to the Paris Institute on the subject of heat conduction. Up to now, mathematical physics had dealt with phenomena already considered by Newton. This was a new topic, and Fourier introduced new methods to deal with it. A committee of several of the greatest mathematicians of the time (including Lagrange, whose Mécanique Analytique is in the Cambridge Library Collection, and Laplace, whose Exposition du Système du Monde and Essai sur les Probabilités are also reissued) acknowledged the originality but was unconvinced by the methods. In 1811, he resubmitted his work to obtain a prize oﬀered by the Institute, but, although he won the prize, the report on his work was unenthusiastic. Pierre-Simon de Laplace (L) and Joseph Louis Lagrange (R) were not initially convinced by Fourier’s work. One major novelty of his work was the systematic use of a decomposition of a general ‘signal’ (think of the sound of a violin) into the sum of many simpler ‘signals’ (think of the sound of many tuning forks). One of the British physicists who took up Fourier’s ideas and ran with them was William Thomson (later Lord Kelvin) of Thomson and Tait’s Treatise on Natural Philosophy. Thomson used Fourier’s ideas to understand why the ﬁrst Atlantic telegraph cable failed and to ensure that the second cables succeeded. When Thomson called Fourier’s work ‘A Mathematical Poem’, he meant it. Generalisations of Fourier’s ideas underlie the mathematics of Quantum Mechanics. The theory of Wavelets, born within my working life, is yet another generalisation of what came to be called Fourier Series. Fourier’s claims for the generality of his method lacked precision. Did his method apply to all signals or only ‘well behaved’ signals? What should ‘well behaved’ mean? Bernhard Reimann (L) and Gustav Lejeune Dirichlet (R) were two of the 19th century’s greatest mathematicians. This problem underlay an important part of the work of two of the greatest mathematicians of the nineteenth century, Gustav Lejeune Dirichlet and Bernhard Riemann. Dirichlet also extended the idea of Fourier Series to give a new method in the theory of numbers – that part of mathematics to which Fermat’s Last Theorem belongs. It became clear that the question of which signals are well behaved was strongly related to the question of which objects have a well deﬁned volume. (Or to make things a bit simpler, which plane ﬁgures have a well deﬁned area.) When, at the beginning of the twentieth century, Lebesgue discovered a new and powerful approach to these problem he gave his solution to the area problem in Leçons sur l’intégration and its application to Fourier Series in Leçons sur les séries trigonométriques. 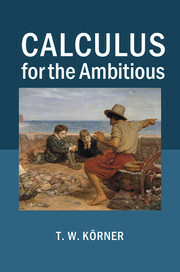 Both books are charmingly written (to the eye of a mathematician) and available in the Cambridge Library Collection. The ﬁnal word on the problem (or, at least the word which Fourier and his contemporaries would have considered ﬁnal) was given by Carleson in a fairly short but very diﬃcult paper written in 1964. Carleson showed that, as was already known, Fourier’s widest claim was false but, that, even then, something quite remarkable is true.